These 5 metre deluxe bell tents are fabulously roomy. At 12' high in the centre, there's plenty of wiggle room, and with a massive 5 metre diameter, they provide a palatial pad for two, a perfect nest for a couple's retreat and plentiful room for the whole family. If you're new to bell tent camping, the benefits are not just in size. Camping under natural cotton canvas is a completely different sleeping experience to the standard polyester tent. No waking up feeling parched and sweaty. The breathable nature of the material, together with the four big vents the tents have, means you are actually sleeping in the fresh air. The vents and the main door have a separate bug screen, allowing the air to circulate through the tent, which all in all is very conducive to a good night's rest. You will also have a wood burning stove in your fully furnished tent, everything you'll need for cooking and eating, a fire pit and BBQ, as well as excellent access to nearby BeWILDerwood and the Norfolk Broads beyond. Plum Tree Grove is a woodland clearing in the heart of the Hoveton Estate in Norfolk – an unbeatable location for exploring all the Norfolk Broads national park has to offer. Set on 4 acres of woodland clearing on the Hoveton Estate, Plum Tree Grove provides shelter to eight of our cosy, stylish bell tents, offering a natural sanctuary to call home while exploring all the spectacular landscape of the Norfolk Broads. On site the surrounding woodland offers children many tree climbing adventures – climb into the branches of one of the big oaks, swing from the ropes, retreat beneath and make their own den for shelter. Want more tree top adventures? Follow the footpath and the yelps of joy to the entrance of the award-winning, enchanting world of BeWILDerwood, family adventure park, home of the Boggles and Twiggles families. Spend a memorable day full of magical woodland family time, then return to camp for your campfire cook up under the stars! The cotton canvas bell tents are fully furnished, featuring single and double beds (depending on your needs) and all bedding and linen included. Wood burners, storage and soft furnishings inside, plus a kitchen box equipped with utensils and vintage dishware. Outside each tent, you'll find a picnic table and fireside log seating and a BBQ/firepit. Brand new shower block on the field, plus a general washing station in the field for dirty dishes. There's also an onsite honesty shop for fire essentials, such as kindling, charcoal, firewood and candles. Rope swings on the trees and den building very welcome. Table tennis. Sheltered canvased areas under the trees. 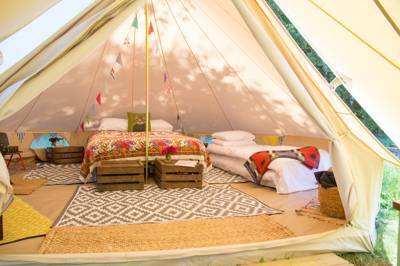 8 fully-furnished bell tents, sleeping up to 5 people each. Glamping only. Dogs not permitted. Large groups, corporate hire, birthday celebrations and (chilled out) stag and hen gatherings available by prior arrangement. It's a short stroll from your bell tent to renowned BeWILDerwood (01692 633033), a homespun fantasy world that is one of Britain’s most unusual attractions for children. Based on series of books by Hoveton Estate owner Tom Blofeld, it brings the reedy, watery environment of the Broads to life for kids – both as a land of make-believe based on the characters in the books and an overgrown adventure playground full of rope bridges and ladders, zip wires and treehouses. You get around by way of walkways and forest paths, and a boat takes you around a tiny broad where Mildred the lisping vegetarian 'crocklebog' blows water at you! If you've got bikes, you'd be a fool not to bring them and, if you haven't, Broadlands Cycle Hire (07887 480331) is within easy walking distance of the site. There's loads of car-free space around the site for cycling around and it's a short and pleasant ride into Hoveton and Wroxham (technically two separate villages but, really, they've just merged into one town). The town is known as the gateway to the Broads – and for good reason. A number of boat hire companies vie for your custom, with day-boat hire from around £35 per hour. Most seat 6 people and let you chug around the Broads at a decent speed, taking turns playing driver and exploring the many canals, rivers and lakes (you don't need to be experienced). A pack inside each tent details other local cycling routes, along with wild swimming spots and riverside rambles – walking to nearby Horning is particularly nice. Other tranquil options include a half-days paddling with the local 'Canoe Man' (01603 783777), a ride on the Bure Valley steam railway (01263 733858) or a drive to the local beaches – it's 20 minutes to Waxham Sands (for sand dune jumping), Happisburgh (for dramatic scenery), Horsey Gap (for seal spotting) or more distant Cromer (for Victorian splendour). No stay on the Hoveton Estate is complete, however, with a visit to BeWILDerwood (01692 633033), which is just a few minute's stroll from your bell tent (see Family Friendly). Being the Broads, there's no shortage of riverside pubs (dare we say, watering holes) to choose from. It's a ¾-mile walk into the nearby village of Horning on the banks of the Bure. Try the beer garden of The Swan Inn (01692 630316; cask ales, pub-food classics) or The New Inn (01692 631223; family friendly, seafood specialities), which also has boat moorings directly alongside. For a lunchtime bite, The Staithes 'n' Willow restaurant (01692 630915) inside a 400-year-old cottage beside the river is a gem or head to nearby Hoveton Hall, where the Garden Kitchen Café (01603 784500) does good coffee, cakes and snacks. Hoveton Estate is 30 minutes from Norwich, just outside Wroxham on the A1062 Horning Road. As you head north out of Wroxham, there's a set of double mini-roundabouts. Go right at the second of these, then follow this road for 1¾ miles and the site is on your left, signposted for Bewilderwood. Turn in here, into the main Bewilderwood car park, from where the track to Plum Grove and private parking is clearly sign posted. Please note Hoveton Hall is different to Hoveton House and the postcode you should use for the latter estate, where the glamping site is found, is NR12 8JW. Wroxham & Hoveton is the nearest train station (trains run from Norwich, which connects with London Liverpool Street and other main line stations). From here it's a 5 minute taxi journey to the glampsite. Buses also run from Norwich to Hoveton but the train is quicker.